Coca-Cola is once again in hot water, after a second "offensive" term was found printed on the cap of a Vitamin Water bottle in Alberta. 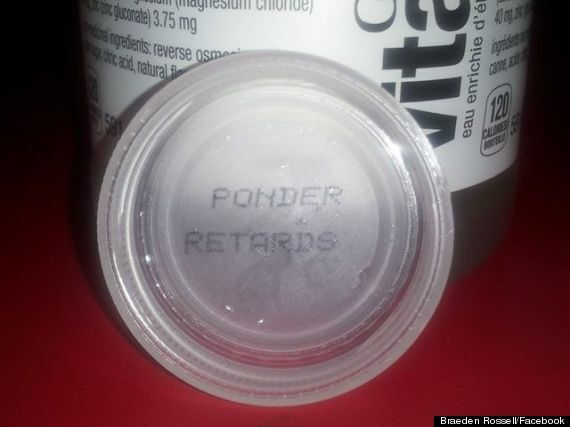 Last fall, Edmonton resident Blake Loates was shocked to find the words "YOU RETARD" printed inside the cap of a Vitamin Water. This time around, Calgary resident Braeden Rossell found the words "PONDER RETARDS" on her cap. Retards in French implies "late" or "delayed." After the first incident, Coke explained the bottle cap was part of a contest being held by Vitamin Water, where they randomly print one English and one French word on their caps. They promised to cancel the promotion after thousands online expressed outrage. However, Coke told Metro Calgary that although the contest was called off, there is still some product floating around, hence the unfortunate second discovery in Edmonton. "The bottle that you’re speaking of would be one that had already been produced and was just in the market from that point on,” Coca-Cola spokesperson Shannon Denny told Metro. Rossell's discovery marks the second time this week Coco-Cola has apologized for a marketing campaign gone wrong. Last weekend the company cancelled a social media campaign related to the Olympics that allegedly prevented users from typing the word "gay" on a customizable Coke can, but allowed the use of the word "straight."